helps you forget the damage or the why. this lumened place you dream of coming to. Hauntingly beautiful, Katherine Gallagher’s Acres of Light is steeped in lyricism. It is observant, evocative, and is above all, a celebration of life. A highly accomplished poet known for her mesmerising attention to detail, in this her sixth collection, Gallagher delivers a stunning series of poems, all of which radiate passion. Indeed, some of the poems indicate a sense of longing, a feeling of missing home. In “Rings” –written in memory of Gallagher’s mother – the speaker appears to resent that she is living “a hemisphere away”. Similarly, the decision to keep everything in lower case in “Snow” seems to suggest that the introduction of capital letters would mean the piercing of the fresh sheets of untouched snow. a sugar-free diet, and testing chairs for comfort. sprinting the extra mile and in happy days for optimists. Teeming with poems which are both expressive and creative, Acres of Light is a delightfully warm collection that observes the world, and rejoices. 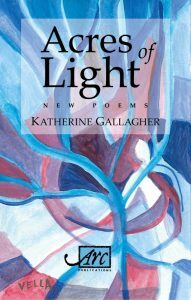 Gallagher’s talents provide poetry that is lively but laced with sensitivity – effective for conveying the wonders and woes of any travels. With such vivid detail and melodious language, truly, life has never looked more beautiful.